There is nothing better than a seamless transition between indoor living areas and outdoor living areas. Imagine a party where guests cluster around the kitchen island for a glass of wine, mingle in the great room and are then drawn outside by the soothing sounds of a waterfall pool and the smell of lobster cooking on the grill! Remove all obstacles that prevent a natural sauntering over to the patio. Make the outside space part of your decoration plan. Couches, side tables (that give those great thigh bruises), and TVs are better served if they don’t block the flow to walking outside at any time. This is not just advice for when your guests show up, but for everyday living in your Florida home. 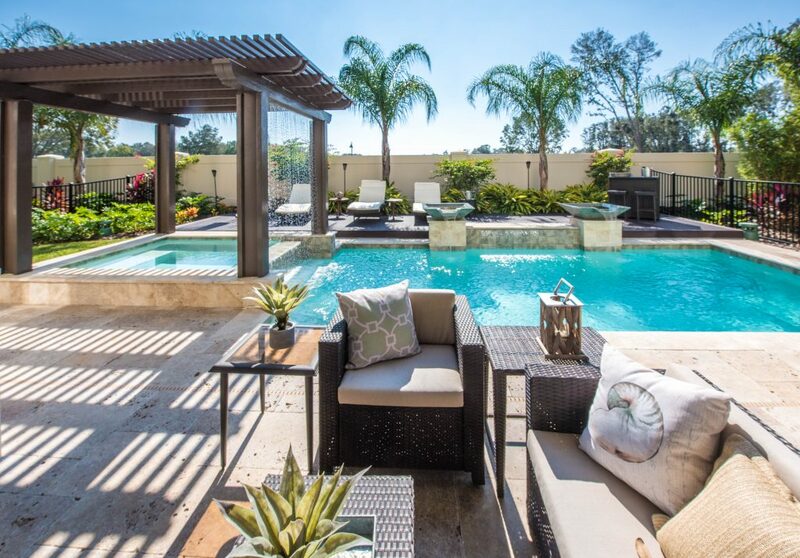 Outdoor ceiling fans, some shade from the sun, cold waters, cold drinks, a pool cage and an open door…there are many things that can help you and your guests embrace the outdoor space. But in the end, we’re in Florida and it’s always hot. Just make sure to help you and your guests bear the heat a little longer with these simple comforts. PRO TIP: For nighttime “doors open” parties, turn down your AC when the doors are open to save on cooling costs. 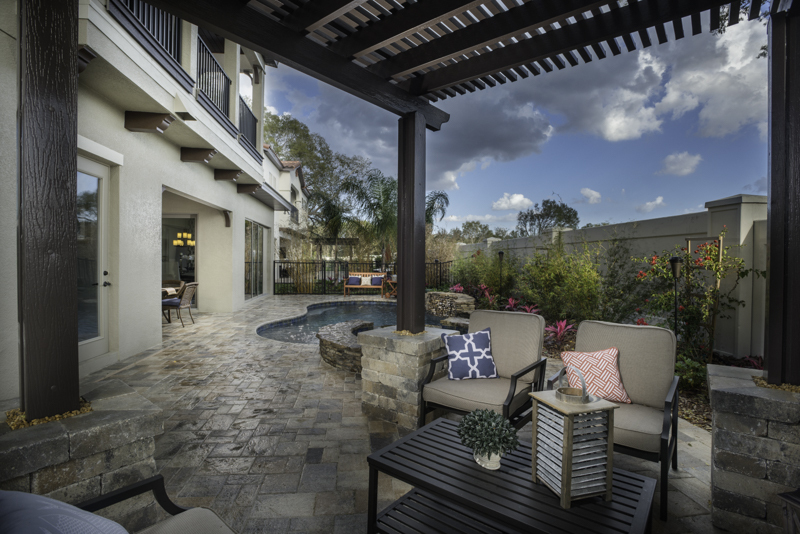 Not only will your guests be more comfortable, but even you’ll be more willing to spend time in your great outdoor space if all the creature comforts of the inside leak outside. Nothing complicated: 2-4 chairs with cushions (that match your indoor or a completely new outside theme), a center table, a grill nearby, an inexpensive TV, pavers or stepping stones. Consider visiting Lowes or many other discount stores that offer outdoor furniture selections. Sometimes they’re ready to create an outdoor package that’s no more expensive than buying all the parts separately. Living in Florida, you can find a wide range of inexpensive to opulent options. Having people over for a Saturday afternoon football game (or The Bachelorette viewing party)? Put the show on in your door space. With Roku, Apple TV, Chromecast, and other internet TV streaming devices using your wifi for a signal, you have no excuse to not buy a TV for the outdoor space or at least move another TV for the night. Guests will naturally linger between the TV and the indoor space for drinks and a place to relax. Some guests will even appreciate the sanctuary from the game if they need a break from the action. 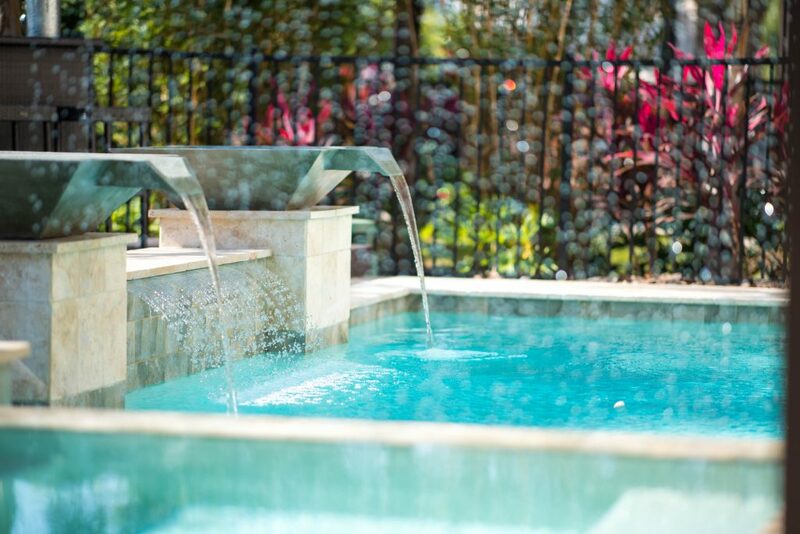 Your pool is there for swimming and taking relaxing dips when the Florida weather is predictably hot. To quote the comedian Jim Gaffigan, “[Florida in the summer] is like the surface of the sun”. 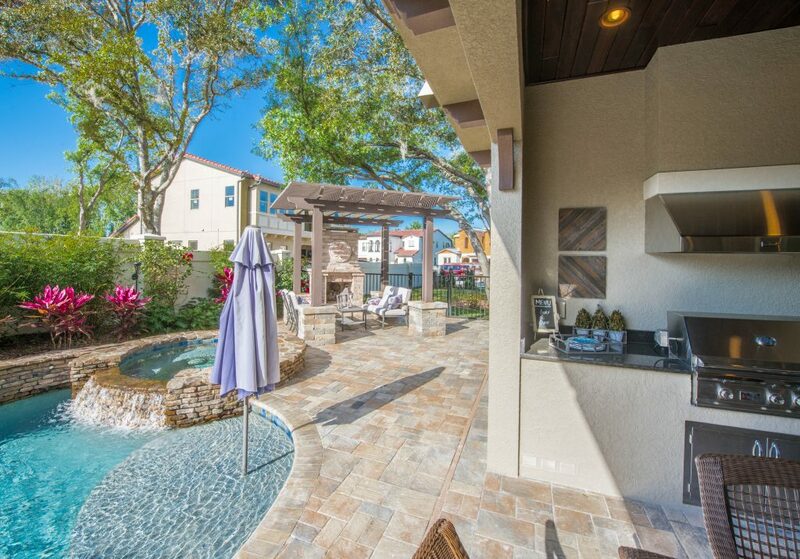 Have a stash of pool towels handy either in the house or in a permanent pool-side cubby. 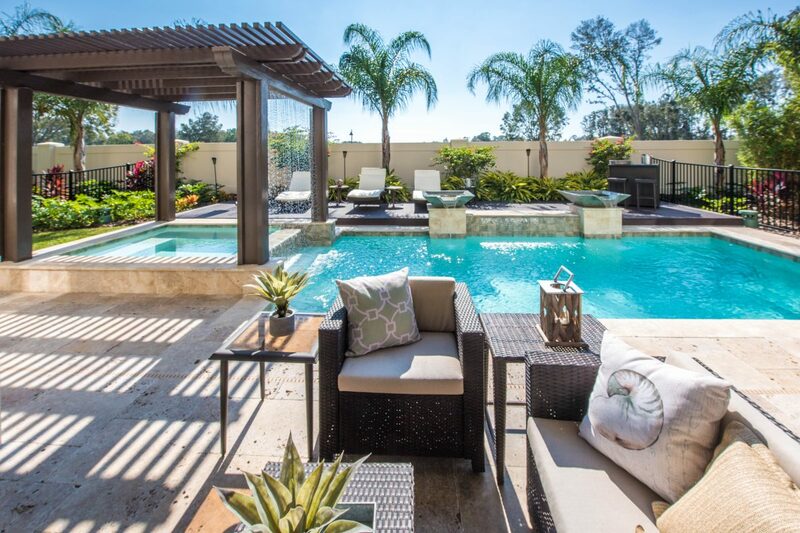 Guests will feel more willing to take a dip if they are burning up from the heat. Wading in the pool while watching the game on TV and talking with a friend is a great way to spend the weekend. A firepit. This one is not always the best choice. While some people love the idea of a warm fire and a calm setting, the smoke is not always welcome. The smoke can also leave a deep smell in your clothes. You also might disturb your neighbors. A gazebo or shelter. An expensive option that can sometimes drive up outdoor furniture costs if you let yourself get carried away at Lowes. Consider the lifespan of a temporary shelter and spend your money wisely on an inexpensive shelter you won’t mind leaving up indefinitely. There are many options on Amazon that we would recommend over Lowes. Twilight parties on uncovered patios are a recipe for a mosquito apocalypse. If your patio is uncovered, consider closing the doors around twilight and keeping some communal bug spray outside. 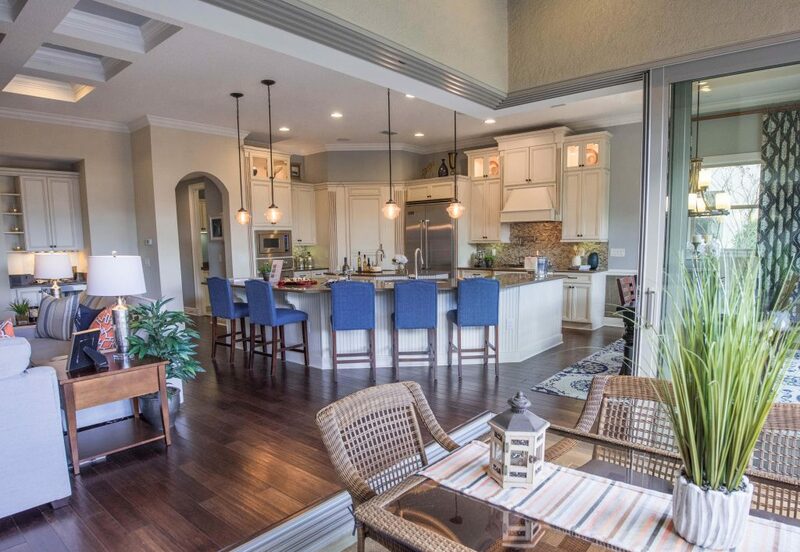 The Sanibel and Delray homes at Canopy Oaks Winter Garden each received a 2017 Parade of Homes Grand Award for innovative floor plans, luxury features, and construction excellence. Upon entering these award-winning homes, guests feel an immediate sense of spaciousness. First floor ceiling heights are 10’8”. Unique ninety-degree glass walls glide open to reveal a private backyard resplendent with a pergola covered spa. A sheet of translucent water droplets rain down into the emerald colored swimming pool filling the air with the soothing sounds of a tropical forest. Natural stone tiles extend beyond the covered lanai to surround the pool. Viewed together, the polished stone colored tiles in the entry foyer, great room and kitchen leads the eye to read both indoors and outdoors as one unified space—a home that invites and enhances “Florida-style” entertaining. Models are open daily at 12902 Roper Rd. Winter Garden, FL.